Born and educated in Dublin but spending much of his creative life in France (even to the point of writing many of his major works initially in French), Samuel Beckett is widely regarded as one of the most important and influential writers of the twentieth century. He started out as a garrulously experimental novelist in the mould of his fellow Dubliner (and sometime friend) James Joyce , but made his name as a uniquely original playwright when Waiting For Godot (En attendant Godot) was first staged in 1953. Its spare, pessimistic scenario, with two tramps waiting endlessly for someone they secretly know will never appear, perfectly encapsulated the uncertainties of the postwar era, and Beckett went on to refine and tauten his vision in a series of plays as notable for their brevity (1969's Breath lasts less than a minute) as their dramatic intensity. Although his novels and stage works form the bulk of his creative output, Beckett also wrote one cinema script and several television plays. Film (1964) was shot twice, firstly in 1965 (US, d. Alan Schneider) with Buster Keaton , and then remade in 1979 (d. David Rayner Clark) with Max Wall . A wordless illustration of the philosopher Bishop Berkeley 's maxim "esse est percipi" ("to be is to be perceived"), it shows a man attempting to evade the prying gaze of everyone from passers-by to his pets at home, before finally realising that he will never be able to escape his own scrutiny. His television work commenced with Eh Joe (BBC, tx. 4/7/1966), in which Jack MacGowran silently listens to the voice of a possibly deceased loved one. In the 1970s Beckett supervised television adaptations of Krapp's Last Tape (BBC, tx. 29/11/1972) and Not I (BBC, tx. 17/4/1977), preserving the definitive performances of Patrick Magee and Billie Whitelaw . The last of these was shown in a triple bill with Ghost Trio and ...but the clouds , two original television plays that depicted isolation, loneliness and longing in memorably stark, almost abstract images. The non-narrative "piece for four players, light and percussion", Quad (1982), was also written specifically for television and first shown on Arena (BBC, tx. 16/12/1982). 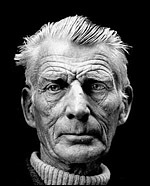 Ten years after his death in 1989, an ambitious project by Blue Angel Films in association with Channel Four , RTE and the Irish Film Board saw the creation of filmed adaptations of all nineteen of Beckett 's plays, involving Atom Egoyan , Damien Hirst , John Hurt , Jeremy Irons , Neil Jordan , David Mamet , Anthony Minghella , Julianne Moore , Harold Pinter , Karel Reisz , Alan Rickman , Kristin Scott-Thomas , Timothy Spall and Juliet Stevenson , with Catastrophe (d. David Mamet, 2000) also containing John Gielgud 's last screen performance.